Approved by the FDA in June 2001, Laparoscopic Adjustable Gastric Band System is the safest, least invasive and only adjustable surgical treatment for morbid obesity in the United States. It induces weight loss by reducing the capacity of the stomach, which restricts the amount of food that can be consumed. Since its clinical introduction in 1993, over 200,000 laparoscopic adjustable gastric band procedures have been performed around the world. Am I A Candidate for Adjustable Gastric Band Surgery? The LAP-BAND® System is not right for everyone. Here are some of the things we will consider when evaluating your candidacy for obesity surgery. While the LAP-BAND System is an effective treatment for morbid obesity, the pounds do not come off by themselves. The LAP-BAND System is an aid to support you in achieving lasting results by limiting food intake, reducing appetite and slowing digestion. However, your motivation and commitment to adopt a new lifestyle are extremely important for long-term weight loss. You must be committed to new eating habits for the rest of your life. Exercise is an equally important component of a changed lifestyle. The LAP-BAND System limits food intake. If you feel nauseated or sick on a regular basis, it may mean that you are not chewing your food well enough or that you are not following the diet rules properly. However, it could also mean that there is a problem with the placement of the band so you should contact us if this problem persists. Vomiting should be avoided as much as possible as it can cause the small stomach pouch to stretch. 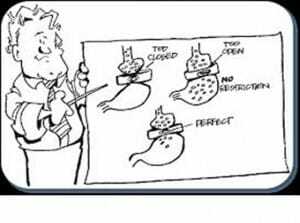 It can also lead to slippage of part of the stomach through the band and reduce the success of the operation. In some cases, it can require another operation. The Lap Band is adjustable. A band adjustment could consist of using a special needle to access the port underneath your skin and then inserting fluid into the band or taking fluid out.Everyone will have different levels of fluid in their band so you cannot compare how many cc’s of fluid you have to someone else. The goal is to be able to eat 8 ounces of food and feel satiety for at least 4 to 6 hours before your next meal. If you cannot eat approximately 8 ounces or you are feeling discomfort after a few bites it may mean your band is too tight and fluid should be taken out. When in doubt call the office to discuss your symptoms with a trained staff person. Weight-loss results vary from patient to patient, and the amount of weight you lose depends on several things. The band needs to be in the right position, and you need to be committed to your new lifestyle and eating habits. Obesity surgery is not a miracle cure, and the pounds won’t come off by themselves. It is very important to set achievable weight-loss goals from the beginning. A weight loss of 2 to 3 pounds a week in the first year after the operation is possible, but one pound a week is more likely. 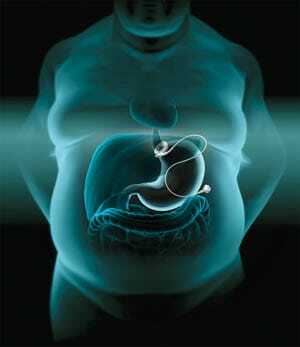 Twelve to eighteen months after the operation, weekly weight loss is usually less. Remember that you should lose weight gradually. Losing weight too quickly creates a health risk and can lead to a number of problems. The main goal is to have weight loss that prevents, improves, or resolves health problems connected with severe obesity. 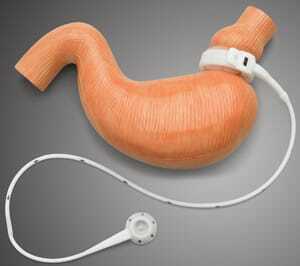 Surgeons have reported that gastric bypass patients lose weight faster in the first year. At five years, however, many LAP-BAND patients have achieved weight loss comparable to that of gastric bypass patients.1 You should focus on long-term weight loss and remember that it is important to lose weight gradually while reducing obesity-related risks and improving your health. Check-ups are a normal and very important part of the LAP-BAND System follow-up. The LAP-BAND does not hamper physical activity including aerobics, stretching and strenuous exercise. Adjustments are often carried out in the X-ray department. They are done there so the access port can be clearly seen. When X-rays are used, your reproductive organs should be shielded. Sometimes adjustments can be done in an outpatient clinic or office, and local anesthesia may or may not be needed. A fine needle is passed through the skin into the access port to add or subtract saline. This process most often takes only a few minutes and most patients say it is nearly painless. There are no restrictions based on the access port. It is placed under the skin in the abdominal wall, and once the incisions have healed it should not cause discomfort or limit any physical exercise. The only sensation you may experience from the port occurs when you go in for adjustments. If you feel persistent discomfort in the port area, let us know as soon as possible. 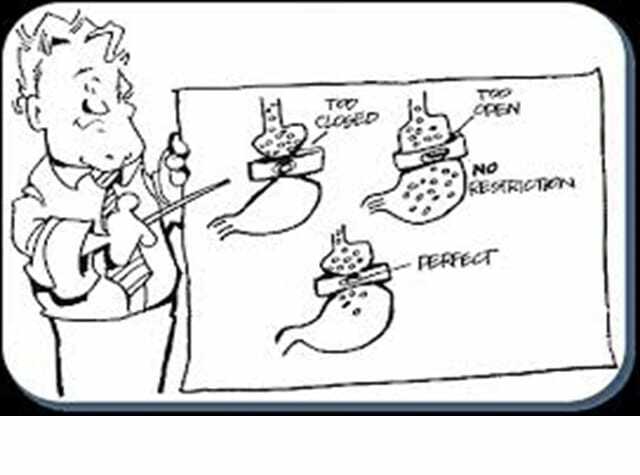 Although the LAP-BAND System is not meant to be removed, it can be, in some cases laparoscopically. 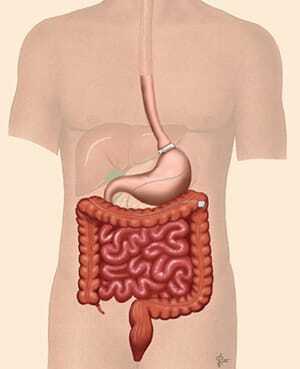 Surgeons report that the stomach generally returns to its original shape once the band is removed. After the removal, though, you may soon go back up to your original weight or even gain more. That is not always the case. As a rule, plastic surgery will not be considered for at least a year or two after the operation, as sometimes the skin will mold itself around the new body tissue. Give the skin the time it needs to adjust before you decide to have more surgery. Is it true that the LAP-BAND seems tighter in the morning? The LAP-BAND makes you eat less and feel full in two ways – first by reducing the capacity of your stomach and second by increasing the time it takes food to get through the digestive system. After a small meal, the amount of which varies from person to person, you should feel full. If you follow the nutrition guidelines when you choose your food and then chew it well, you should not feel hungry or deprived. Remember that the LAP-BAND is a tool to help you change your eating habits. You may. It’s possible to not get enough vitamins from three small meals a day. At your regular check-ups, your specialist will evaluate whether you are getting enough vitamin B12, folic acid, and iron. You should be able to take prescribed medication though you may need to use capsules, break big tablets in half or dissolve them in water so they do not get stuck in the stoma and make you sick. You should always ask the doctor who prescribes the drugs about this. Alcohol has a high number of calories and breaks down vitamins. An occasional glass of wine or other alcoholic beverage, though, is not considered harmful to weight loss. After your stomach has healed, you may eat most foods that don’t cause you discomfort. However, because you can only eat a little it is important to include foods full of important vitamins and nutrients such as those advised by your dietitian. If you eat foods that contain lots of sugar and fat or drink liquids full of “empty” calories, such as milkshakes, the effect of the LAP-BAND may be greatly reduced or cancelled. There may be some reduction in the volume of your stools, which is normal after a decrease in food intake because you eat less fiber. This should not cause you severe problems. If difficulties do arise, let us know as soon as possible. And remember to drink at least 6-8 glasses of water a day. O’Brien P., et al, LAP-BAND: Outcomes and results, J of Laparoend & Adv Surg Techniques, 13(4), 2003, 265-270. Clegg A., Colquitt J., et al, The clinical and cost effectiveness of surgery for people with morbid obesity, Health Technology Assessment, 6(12) 2002, 1-153. Dixon J., Dixon A., O’Brien P. Light to Moderate Alcohol Consumption: Obesity and the Metabolic Syndrome. 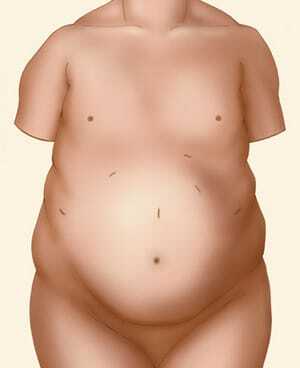 Am J Bariatric Medicine 2002; 17(4): 11-14.